Designer Bethan Laura Wood, renowned for her bold use of pattern and colour, has created a striking art installation of garlands at London restaurant and gallery sketch. On show until the 6th January, the installation transforms the entrance hall of the Mayfair culinary destination with colourful PVC jewels lit up in a powerful display. Drawing inspiration from the tradition of British eccentricity, and the building's heritage as the London atelier of Christian Dior, Wood has combined the charms with brass rivet detailing as well as a sprinkling of Christmas glitter. 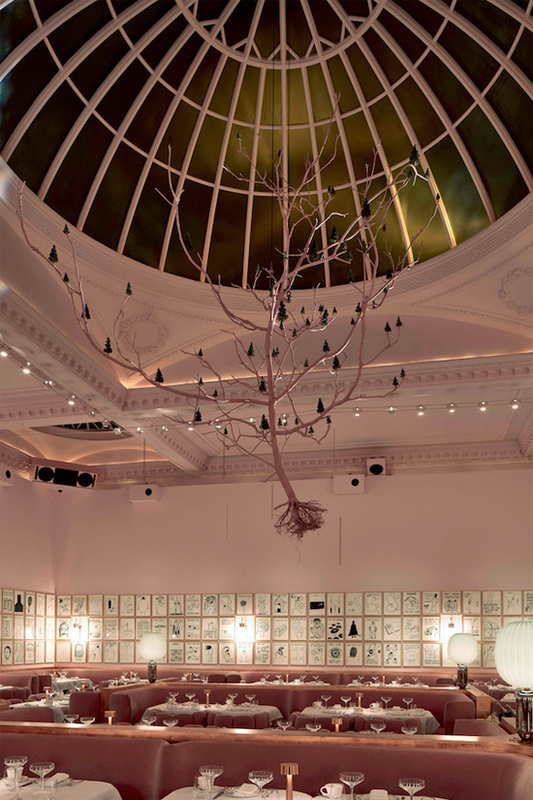 Meanwhile in the centre of the candy pink Gallery restaurant, creative agency Mark Lawson Bell Studio has suspended a large pink tree. Titled, 'All Our Christmases', it bears the 'fruit' of 75 small Christmas trees and miniature ladders, which represent sketch's family of staff and collaborators since its opening 14 years ago. Over the past decade, sketch has hosted over 50 exhibitions of artists work, including Cartsen Nicholai, John Baldessari, Jonas Mekas, Mary Ellen Bute and more recently Turner Prize winner Martin Creed as well as David Shrigley.